Well Turn It Up, Man! So yeah, that Family Dynamic mix is a corker, right? I’ve known Rob for a few years now, and he and I have musical tastes that are eerily similar…but with slight variations, too. There’s enough overlap and dovetailing in the musics we both tend to listen to that, well, we had to do a CD mix together. So yeah. He and I labored over this thing for a few weeks now, and here’s the results. Hope you like it. A holiday weekend gift from Morton and me, for you to listen to and enjoy. Again, it’s all joined together as one long .mp3 file to preserve the continuity and flow and segues. If you want to burn it to CD, be sure you used the “disc-at-once” method, or you’re likely to get weird “hiccups” in the transitions. Oh! One other thing: Have a terrific weekend, folks! 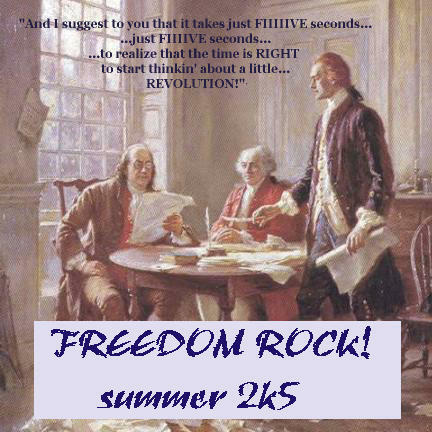 Get Yerself Some Freedom Rock Right Here! Nice. Thanks! Can you publish the tracklist? A track listamundo…1. Preamble by President Bill Pullman. 2. “I’m Free” (The Who) 3. “Firecracker” (Ryan Adams) 4. “July! July!” (The Decemberists) 5. “Revolution 80” (Tahiti 80) 6. “Independence Day” (Elliott Smith) 7. “America” (Simon & Garfunkel) 8. “Staring At The Sun” (TV On The Radio) 9. “La Revolucion” (Ugly Duckling) 10. “Pledge Of Allegiance” (Louis XIV) (Parental Advisory!!!!!) 11. “The National Anthem” (Radiohead) 12. “Lady Liberty” (Okkervil River) 13. “Fourth Of July” (Galaxie 500) 14. “That Noonday Sun” (Noonday Underground) 15. “Hot Fun In The Summertime (Sly & The Family Stone) 16. “Burned By The Sun” (Beulah) 17. “Revolution” (Spacemen 3) 18. “Freedom Rock” (Frank Black) 19. “Sun” (Margo Guryan) 20. “Liberty Belle” (Super Furry Animals) 21. “Summer Babe” (Pavement) 22. “It Must Be Summer” (Fountains Of Wayne) 23. “Saturday Sunset” (Drugstore) The clever and brilliant bits are Rob’s. The tedious parts are mine, but left in there intentionally to make the good parts stand out more! Really, this list is as much about what I don’t see as what I <>do<> see. Here’s what I’m NOT seeing:1. Molly Hatchett2. Skynard3. Allman Bros Band (aka, “The Sasquatch Experience”)What I’m getting at is, there seems to be a rather gaping hole..a paucity, if you will….of Southern Rock represented here. And it saddens me to see you so blatantly ignore the great masters of this regional, southern craft AND your own roots. An aside: If you notice, I had the words “masters”, “southern” and “roots” in a paragraph in a sentence, and it didn’t have anything to do with Ricky Clemons. Do the google search, and you’ll see that it’s the only place this is the case in all of the whole-wide-world-web. Go ahead. Believe me…it’s true. Squeakers ain’t the same without you, man. It’s so right what they say; you can’t go home again. At least, not with the restraining order. ciao. Ah, Stu, how wrong you are!Sure, there’s no Skynyrd. I fought for it, but got overruled. If I’d have had my way, the whole thing would’ve been an 80-minute loop of the guitar break from “Free Bird”.I will point out though that:Beulah is from Athens, GA.Ryan Adams is from North Carolina.London, home of The Who, is in the south end of Merrie Olde. So there ya go.Good to type at you again, bud! That may all be true…but as I learned in the news business, there’s a LOT more to the truth than facts, mon frere. But the germaine question is this, and only this…would it play at Squeakers? I think you know the answer. And it has a Swedish accent. A fun morsel, as I take my leave….>> Do yourself a favor: make sure you open these links in separate windows, and let the fun commence. Juxtaposition isn’t just a big, fun-to-say-word, it’s part of the comedy that ensues. http://www.tothesource.org/9_11_2003/shoe_bomber.jpghttp://www.stockrockshots.com/pb2158.jpgI don’t know why J. Geils decided to rock out with Bruce Boxleitner as they clearly did in pic #2, but what a show THAT must have been. Oh, and I think Peter Wolf spent quite a bit of time in South Portland, Maine. And that, old roomie, is what we in the business call symmetry.